With the rise of multi-cloud strategy, it is becoming crucial to rethink hybrid cloud integration strategy as well. According to Liftr Cloud Insights, 81% of enterprises are participating in a multi-cloud strategy and 51% are deploying a hybrid cloud solution that combines the public and private cloud. To deal with unexpected workloads and variance types of environments, agility, scalability, and adaptability are critical characteristics that must be available on modern integration solutions. If you want to reach this kind of architecture, you can take a look at the cloud-native design pattern. One of the benefits of modernizing monolithic applications into micro-components is the agility to lift and shift the components as needed. Taking the same principles and applying them to the integration platform can empower organizations to adapt to the changes. This concept is called agile integration architecture. The approach relies on a decentralized integration layer, and it benefits from the containerization and API technology. There are three main pillars in agile integration architecture: fine-grained integration deployment, decentralized integration ownership, and cloud-native integration infrastructure. It should take you approximately 20 minutes to complete this tutorial. One of the challenges of a traditional integration pattern is the coupling between the components, regardless of their relationships with each other. A simple modification made to the overhead work, such as an upgrade, might cause several issues. The cloud-native pattern affects an organization’s culture where a team can be formed by business-focused and project (service) requirements. For example, a single group might be mixed with a developer, an integrator, a designer and a consultant. The team has full autonomy and confidence to make changes without affecting other services. Teams focus on what their responsibilities are, and expertise increases. This approach brings a new level of productivity and innovation. A part of the transition to agile integration architecture is applying the cloud-native “cattle not pets” approach with the support of technology like Docker and Kubernetes. It takes seconds to create or dispose of containers to scale the workloads up and down. A considerable improvement is the start-up time, because containers are running in a shared host, which eliminates the need to reproduce the operating system files when a container starts or stops. If you’re interested in learning more about the concept, check out Agile integration architecture: Useful links on the IBM Integration community. Push the image to the cloud registry. Run the application on multi-clouds. IBM App Connect Developer Edition a platform that supports the full breadth of integration needs across a modern digital enterprise. Docker Containers a lightweight, stand-alone, executable package of software that includes everything that is needed to run an application: code, runtime, system tools, system libraries, and settings from one computing environment to another. Kubernetes an open-source system for automating deployment, scaling, and management of containerized applications. 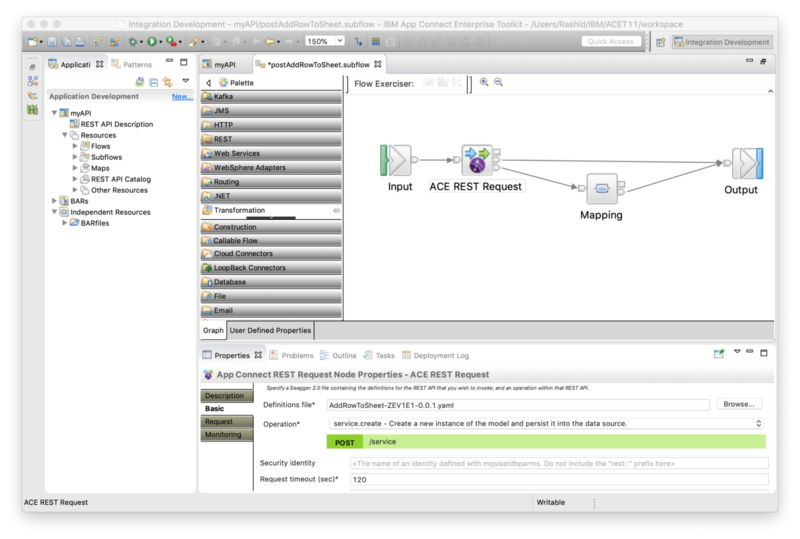 I prepared a simple integration flow, which can be invoked through an HTTP POST operation. Also, I used the pre-built Cloud connectors at IBM Cloud Integration to integrate with other third-party systems like SAP, Salesforce, and Slack. At this stage, you only need to use the BAR file. Navigate to your directory where you saved the BAR file, and then follow the next steps. The following screen capture shows IBM App Connect. To learn more, see Get started. Step 1. Create the Dockerfile. Use the following file to create your Dockerfile for the integration solution. You need to insert your BAR file name on line 3. Step 2. Build the container image. $ docker build -t <hostname>/<namespace>/<image-name>:<tag> . $ docker build -t cluster.icp:8500/default/myintegration-flow:1.0 . Step 3. Push the container image. Step 4. Create the deployment file. To start deploying your integration solution into Kubernetes environments, you begin by creating the deployment file that includes the solution and app definitions (for example, the image path and environment variables). As shown in the following example, you can define the multiple instances (replicas) of the same app to make your app resilient (line 8). Step 5. Create the service file. The following screen captures show the IBM Cloud Private environment and the Google Cloud environment. 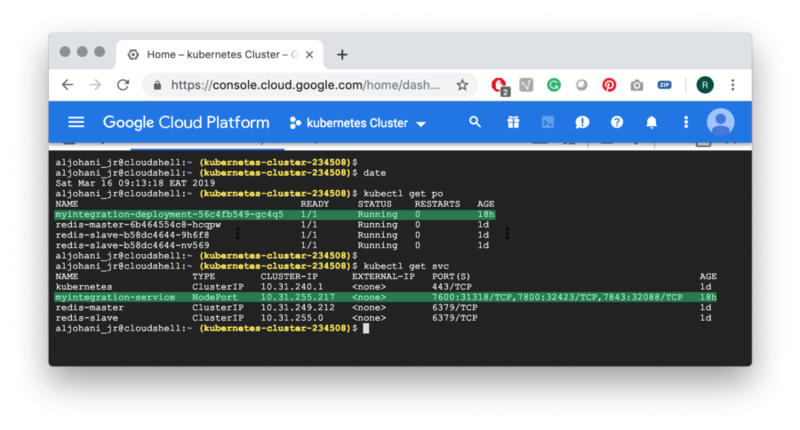 As you can see, both environments are running your integration solution fine, and Kubernetes is taking care of incoming port traffic and mapping them to your target ports (for example 32060 mapped to 7600 on IBM Cloud Private and 31318 mapped to 7600 on Google Cloud Platform). In a few steps, you took one integration solution, containerized it, and then deployed it on multiple cloud environments (IBM and Google). You can apply the same measures on any other integration apps and solutions, still maintaining your integration platform as agile, scalable and adaptable. The secret behind this approach is the integration runtime environment. 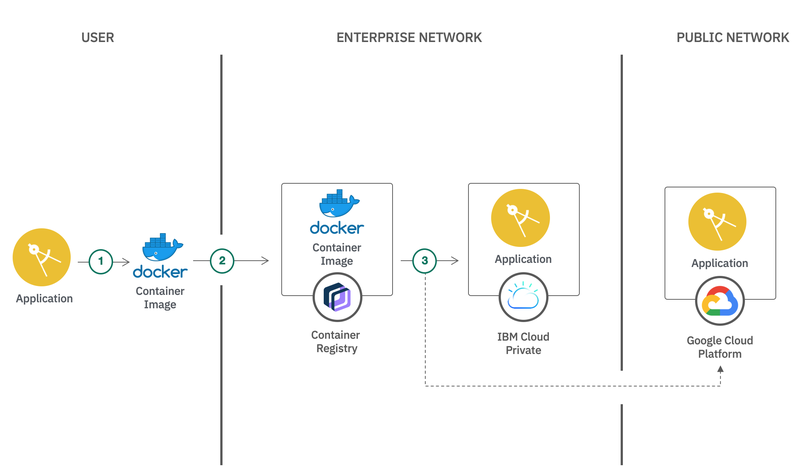 The examples in this tutorial include the IBM App Connect Enterprise, which provides a light-weight integration runtime environment for cloud-native and container-based deployment. 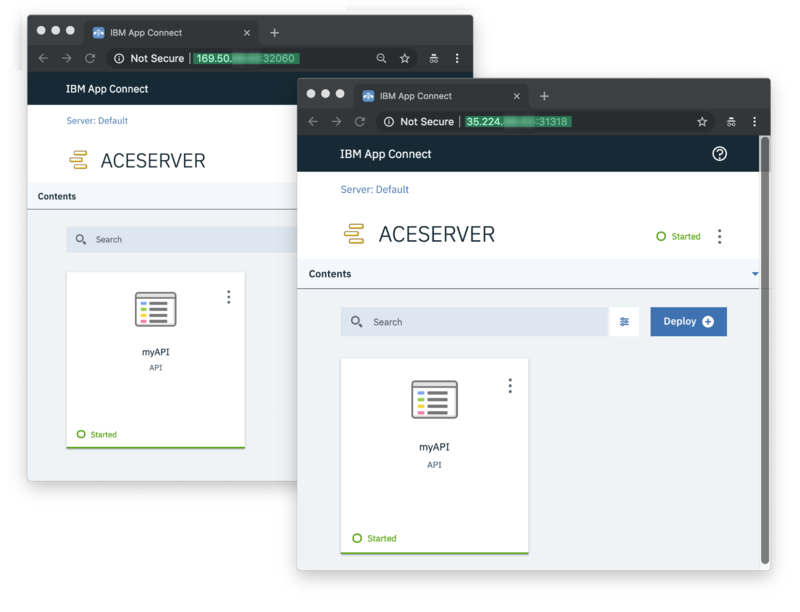 Similar to App Connect Enterprise, all other IBM integration components are ready-made for container-based implementation to support your multi-cloud strategy through the complete IBM Cloud Integration Platform. You can try it for yourself here.